Today was the "A taste of Christmas" high tea garden party fundraiser for SECET that I have been busy making items for over the last few months. I have posted many of the piccies up as I have made them but there are a few items I have yet shown you. 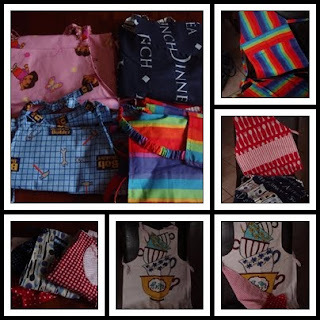 The large photo in this first collage shows you the goodies I made , I am really happy to say that most of the items I made had sold. These are two of the three table runner I made (Beryl helped by doing the binding for me). Two sold - the scrappy one at the top of this piccy didn't sell but that's ok as I really liked it and will simply keep it for myself. 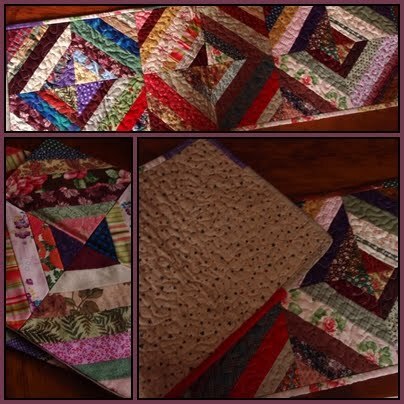 The other two runner were made using a cotton blossom JR that I bought form Jane a few weeks ago. It wasn't really my colours so was very happy to use it for the table runners. I just love how this gorgeous bag turned out. 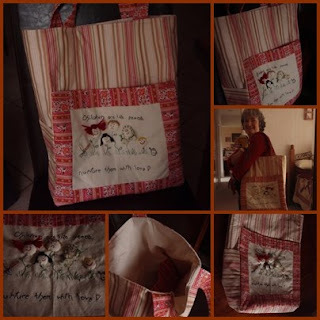 I had this stitchery waiting to be stitched up and I just knew i would not get around to it so I gave it to Beryl to stitch, when she gave it back I turned it into this stunning bag with lots of pockets. The stitchery itself was made into a large pocket at the front of the bag. I added pockets on the side which are a great size for a water bottle and there is a large pocket right along the inside. A collage of all my aprons. 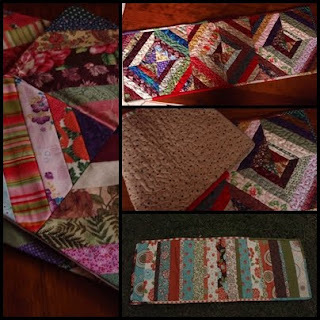 These all sold and I have orders to make 5 more - I believe I will get more orders. One lady wants a strawberry one made and has some fabric left over from curtains she has just made for her strawberry shed at her nursery. I had to work this morning so I turned up just before they stopped allowing people to enter. Had a nice cup of tea with Lydia and a gorgeous array of yummies. And then wandered around and bought some yummy treats as well as a Zuzhinni relish and a quilted sun glass holder. By all accounts the day was very successful with it very busy for most of the morning. Got a bit quieter in the afternoon but I think that is often the way. 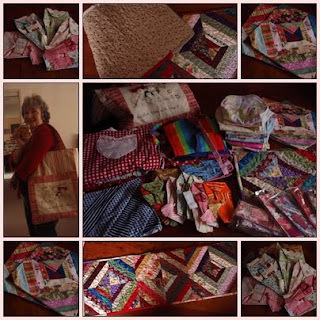 I guess I will find out at Church tomorrow or at Quilters how much was raised. I am very grateful that God has given me a creative skill and that i can help to make a difference in his kingdom by sewing items to be sold to raise money to keep scripture teachers in our high schools. Thank you for sharing the photos all those goodies that you created. Well done. Love that bag turned out lovely. Well done on your fundraising sewing. We will have to call you the "apron lady" now.